Apparently it rained during the night. Well that’s what Jan told me. As usual, I slept like a log and was only woken by a pair of cold hands being run over my cuddly warm body. Someone also puts their cold feet on me. Reader you might be forgiven for thinking I’m a bit of a door mat. By the time I’d fed myself it wasn’t raining; but then it wasn’t sunshine either. Last night’s plan was to walk to the adjacent retail park and top up the pantry. Some bread would negate the need to keep taking penicillin. Unfortunately Halfords didn’t have the engine oil I wanted and B&Q didn’t have a suitable replacement garden hose. We’ve had the current hose for almost three years and consequentially have been thinking it’s probably time for a replacement. The trip to Sainsbury’s was more fruitful, although Jan did complain about the size of the bill. I mentioned the largish joint of beef she had purchased carefully avoiding mentioning the two packets of vanilla custard filled doughnuts. Back at Waiouru a decision had to be made whether to stay or go. I’d like to get to Atherstone before the weekend and have Cox’s Automotive look at the 175A alternator so we made the decision to go. I asked Jan to take a photo of Peel’s Wharf as we passed. Two reasons; everyone else takes a photo; and it looks a nice mooring spot. However they are long term moorings only. An approaching boat pulled across to the towpath and started to moor. 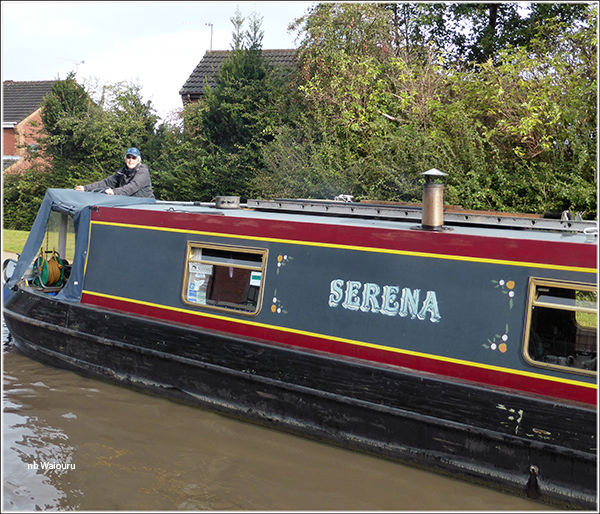 It wasn’t until the lady at the bow started to wave that we realized it was Judith & John on nb Serena. 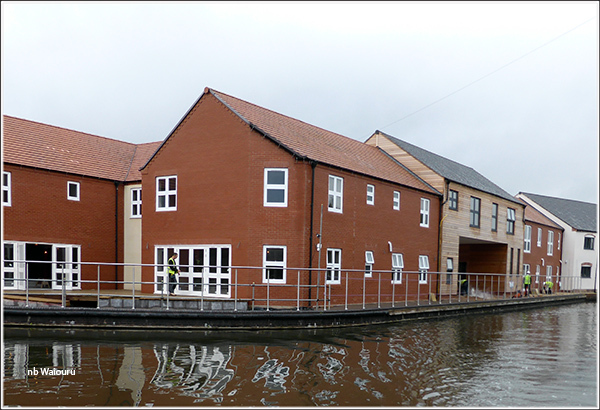 The new residential development at Fazley Junction has progressed since we passed this way in early June. 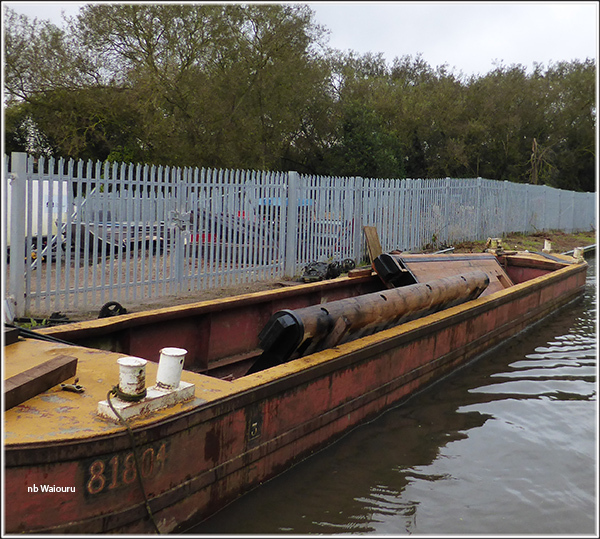 There was a CRT barge moored on the offside just before the Thame Aqueduct and we noticed it contained a set of new mitre lock gates. The only locks near here are Glascote Locks. 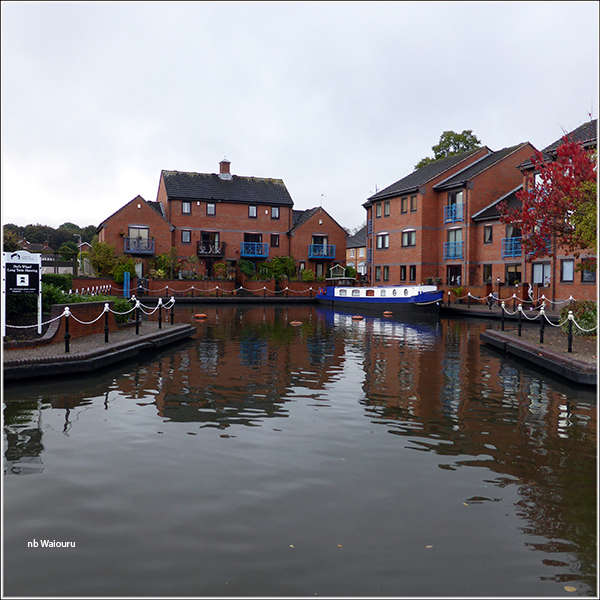 There always seems to be a queue at Glascote Locks. I recall the first time we went up this flight of two locks the queue went around the corner and out of sight. Today there were only five boats and we were second in the queue. Jan went off to help and after we’d gone through the second lock she was muttering about “ladies doing lunch”. I must admit the lady did watch Jan do all the paddle winding. We wanted to top up the water tank and the tap is just above the top lock. After mooring and running out the hose we went back to assist the following boats up through the locks. The tank had filled before the fourth boat had cleared the bottom lock and he appeared to be a solo boater. I emptied the top lock and opened the gates for him and he waved his thanks as we departed. Thereafter the cruising weather became a mixture of sunshine and showers. There seemed little point in both of us braving the elements so Jan went inside where she fired up the slow cooker to cook that large joint of beef purchased in the morning. She then attended to the banking and paperwork whilst I enjoyed the scenery. 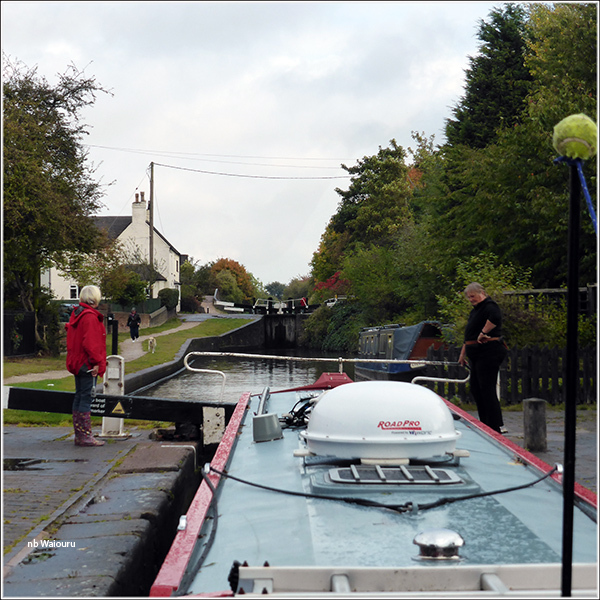 The two boats ahead of us stopped at Polesworth. One for a paper and the other for lunch. 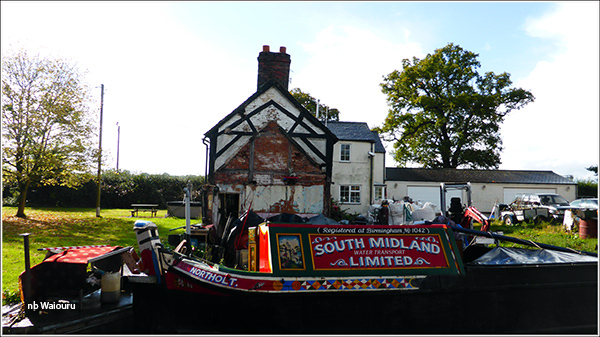 We ate on the move and eventually reached the moorings below the Atherstone flight around 2.30pm. Everything turned out as planned. We have the dot and the DTV signal is so strong the aerial is providing a great picture whilst lying flat on the cabin roof. Thirty minutes later it hosed down and we smugly watched a couple of boats pass with crews that looked like drowned rats. I’ve spoken to Cox’s Automotive for a second time and will take the alternator to them around midday tomorrow. Lovely to see you both this morning. The new engine is going great and so much quieter than the old one. 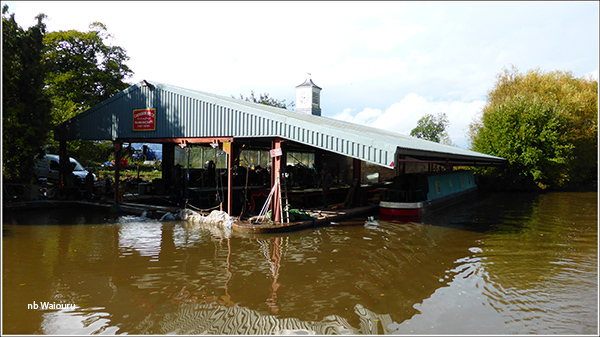 We're hopeing to get to Stourport by mid week next week as we need to go home. Keep up the good work on the blog I do so enjoy it. Have a good winter and hope to see you on the cut next year.